Egyptian President Abdel Fattah el-Sissi, whose nation's own extensive offshore natural gas reserves have proven to be a boon to both the Egyptian treasury and to its own consumers of natural gas, told a recent gathering that Egypt is working hard to develop the resource. He says that God has blessed Egypt with self-sufficiency and even more than that in natural gas reserves, and it is only for the purpose of increasing the distribution network across the country that the government has raised prices. "Already Egypt has long pipelines since long ago and [they are] ready. If other countries want to build a pipeline, it is expensive and it will take a long time and they don't have enough gas for sustainable exports," said Sadek. "Egypt has one of the biggest gas fields in the Mediterranean, al Zohr, and that's why Egypt has this potential that they will be exporting and they will take from smaller fields that the neighbors have and buy them, re-export them and make a [profit]." Sadek says he does not think gas exports to Europe from Egypt, Israel or Cyprus will affect the dependence of Western Europe on Russian natural gas, however, since most of the Mediterranean gas will be going to southern and central Europe. 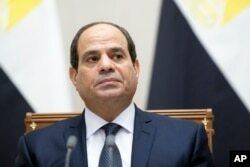 He also says cooperation between Israel and Egypt will not stir up any serious opposition inside the country. Paul Sullivan, who is an adjunct professor at Georgetown University, is not so sure. He tells VOA "there are still many in Egypt who are anti-Israel [and that] the pipeline would be under risk." He stresses that the region is "fraught with angst and anger," and he argues that ordinary Egyptians "need to understand how this might help them and not just the super rich and well-connected."